Not sure what welders are used for? Often a complete beginner will ask what are welders used for? In the case of steels and put simply welders are used for melting metals together. This can be achived by using an electric arc to heat the metal to a molten state and allowing the two pieces to flow together. There are three main types of welding machines used. These are Tig Welder, Mig Welders and Arc Welders. – Tigs Use an electric arc to melt materials inside an inert gas shield. A tig filler rod or wire is often used to flow into the weld to build it up. These tig welders are also known as Gas Tungsten Arc Welders (GTAW) because they use a tungsten electrode to fire off the electric welding arc. – Migs Use a wire that is short circuited causing it to melt. As the wire melts it forms part of the molten pool of metal that fuses the parts together. Mig welders are also known as Gas Metal Arc Welders (GMAW) because they also use gas to shield the arc but use metal for the electrode. The metal is on a spool called the mig wire. – Arcs Use an electric arc and a stick electrode. The electrode is coated with a flux and looks like a big fat sparkler. When you strike the electrode on the job is melts the flux coating which ionises and causes an electrically conductive gas shield which also protects the arc from oxygen. The metal rod inside the electrode both acts as conductor for current and also the filler material. 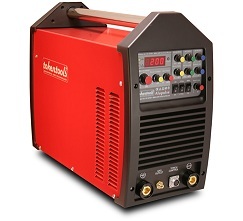 These arc welders are also known as tick welders or Manual Metal Arc welders (MMAW). The arc is manual as the operator sets the arc length by holding the welding electode off the job a set amount. Not sure what you need, please call us on 1300 881 991 to discuss your needs. Our friendly staff can give you their oppinion of what is the most suitable type of welding machine for your intended welding projects.